How Much Soccer Ball History Could There Be? It may seem like such a simple item, but soccer balls are actually incredibly complex in their research, materials, and construction. It wasn’t always like this though. In fact, the first soccer balls used were downright crude. Early soccer balls were created using nothing more than inflated pig bladders and strips of leather. When soccer and rugby first split into separate sports, soccer was played with nothing more than the rugby balls that were previously being used. As soccer gained in popularity, balls designed specifically for soccer were created. Early on in soccer ball history, balls were usually stitched from strips of brown leather wrapped around a pig bladder or some other inflatable tube. These balls would wear easily, and had many drawbacks including a horrible tendency to absorb water. The name Goodyear is probably familiar to many. The Goodyear rubber company has become known for its Goodyear tires and of course the Goodyear blimp. 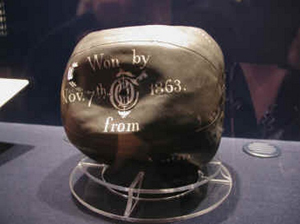 Charles Goodyear used his expertise working with rubber to produce the first spherical football in 1855. This was before the modern rules for soccer were even established! Because vulcanized rubber was used, the ball was given added strength and was better able to withstand the heat and cold. Prior to this, the leather balls would wear rather easily. The biggest issue was the way that the leather ball would absorb water. This would make the ball heavy, harder to kick and dribble and, most troublesome of all, painful to head. Eventually, the FIFA Laws of the Game had a hand in determining soccer ball history and stated that the ball should, quite obviously, be spherical and be covered in leather or some other kind of approved material. 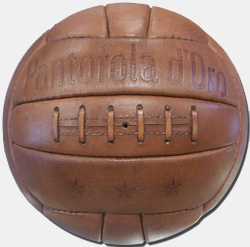 Leather balls took off in popularity because they retained their form better after a match, and it was easier to stitch the panels together during the manufacturing process compared to rubber made balls. Early balls were made of dark brown leather simply because this was the colour that the leather would turn when it was cured. Eventually though, it was determined that the dark ball was difficult for spectators to follow on the green surface, especially once matches starting being played under artificial light. Luckily, sometime in the 1950’s a white ball was introduced to help make the ball more visible. Modern designers like Adidas, Puma, Nike, and Mitre have all begun to experiment with new materials with full leather balls becoming much less common in the later stages of the 20th century and are slowly being relegated to soccer ball history. Interesting to note, the panels are all flat, and the ball does not become round until the bladder is filled with air and the panels expand. This explains why a deflated ball hardly looks round! Modern soccer balls are made by stitching together a number of panels of a certain shape around an inflatable bladder. Current designs see either 20 hexagons or 12 pentagons stitched together. Alternatively, the very popular 32 panel truncated icosahedrons design has become a staple of modern ball design. Inside, the balls are filled with a latex bladder that fills with air to expand the ball. I guess the pig bladders of days gone by were simply too prone to failure? While in years past, balls were all made with either leather or rubber, today balls can be found in many materials ranging from synthetic leather to plastic. A popular material used today is a kind of plastic called polyurethane, which is used either in whole or in part to create the ball. This type of plastic is soft, provides a good feel, and is extremely durable while absorbing much less water than leather.